Developed in 1917 in New Hampshire by Arthur Treadwell Walden, the Chinook's main duty was that of a sled dog. The Chinook breed was capable of pulling heavily laden sleds over long distances. An extremely hard working breed, they nearly became extinct. Today, there are an estimated 500 known in existence. The Chinook breed is considered to be rare and is quite difficult to obtain. A distinctive American breed, the Chinook has a dignified demeanor, keen expression, and athletic build. This breed has a smooth and graceful movement and possesses a gregarious nature. Chinook's are a slow, maturing breed. The Chinook breed is loyal, intelligent, calm, and friendly. They are excellent with children, dogs, and other household pets. This breed is somewhat wary of unfamiliar surroundings and people, but is never aggressive or shy. Chinook's are reliable, versatile, dedicated, and patient. They make excellent workers and family companions. 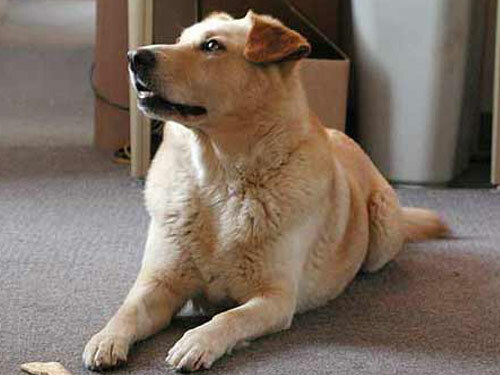 The Chinook breed is not recommended for watchdog purposes as they are not prone to bark. They are sensitive and do not do well if left alone for extended periods of time. The Chinook requires minimal grooming as the coat practically takes care of itself. Weekly brushing with a firm bristle brush will minimize loose and dead hair. Health problems associated with this breed include eye abnormalities, skin problems, hip dysplasia, seizures, and cryptorchidism. The Chinook is a double coat breed. The outer coat is dense, coarse, of medium length, and lies close to the body. The under coat is soft and thick. The hair on the neck, chest, and tail is more profuse. The Chinook breed is a heavy shedder. The Chinook breed is intelligent and eager to please. Early socialization and obedience training are recommended. They do not respond to harsh or heavy-handed methods. Training must be done with respect, firmness, fairness, and consistency. The Chinook is not recommended for apartment living. They do best with a securely fenced yard. Chinook's do not require an inordinate amount of exercise and are not considered an outdoor pet. This breed excels in carting, sled-pulling, packing, search and rescue, agility, and fly-ball.